Are you looking for a voiceover recording? My name is Mike Porter Im a professional British voiceover and ive spent the last 20 years working for some of the largest radio groups in the UK and as a result ive been trained by some of the best voice coaches in the business. Are you looking for a voiceover recording? 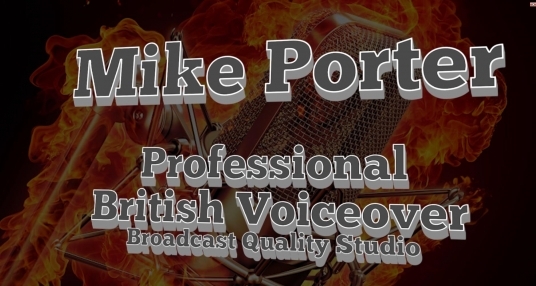 My name is Mike Porter Im a professional British voiceover and ive spent the last 24 years working for some of the largest radio groups in the UK and as a result ive been trained by some of the best voice coaches in the business. All VO's are delivered as an mp3 (192kbts) within 24 hours, if you want a wav file or delivered faster or if you need the VO timed to fit your video just buy the appropriate job extra. Please make sure your script is correct before sending it to me as if its wrong I will charge to voice it again. Please note I offer 1 revision on each job, if you require any more versions just buy the jobs again. Great as always and the delivery was super-fast !!!! Thank you Mike, great voiceover. Better than I had imagined. Will be in touch for further work! Thank you. Excellent Voice, exactly what I needed for my project. Quick turnaround. Highly recommended! Great voice and quick service. Excellent service delivered within minutes!!! !